On Friday, Sunview Elementary School celebrated International Walk to School Day. Over 275 people, including parents, students, friends and extended family members, walked from Brainard Park to Sunview Elementary School. Principal Taylor greeted the families and led the walk with her megaphone in hand. The event demonstrated Sunview’s support of walking to school as a means of fitness and overall wellness. It also shows that families feel a sense of safety in the community. All students who crossed the finish line were rewarded with prizes from several PTA volunteers. In addition to the walk, several students created Walk to School posters for the annual poster contest. Third graders also exclusively participated in the annual Third Grade Walk-a-thon on Friday from 9-11AM, as students walked laps at Brainard Park. Pledges were made for each lap to raise money for fun end of the year third grade events. 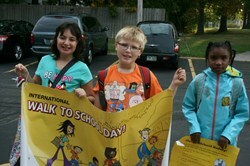 Sunview thanks all that participated for a fun event on International Walk to School Day!